If you check out my life list, you’ll see it’s a work (life) in-progress. This year, my goal is to cross five big things off my list. 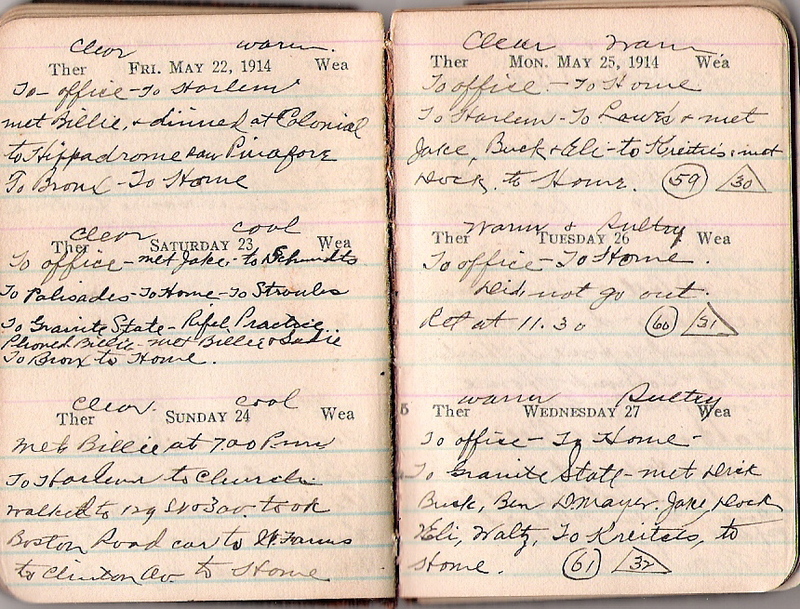 #43, Follow the Diaries, has been 93 years in the making. Here is the story. One is from 1914, then 1921, and lastly, 1923. The diaries belonged to Raymond Enders of 27177 Washington Ave, Bronx, New York (and later of 254 East 184th Street). He was an employed by the Italian Discount & Trust Company, a bank, located at 399 Broadway, New York City. The New York Times announced the bank’s establishment in July of 1918. Further history on the bank can be found here and here. 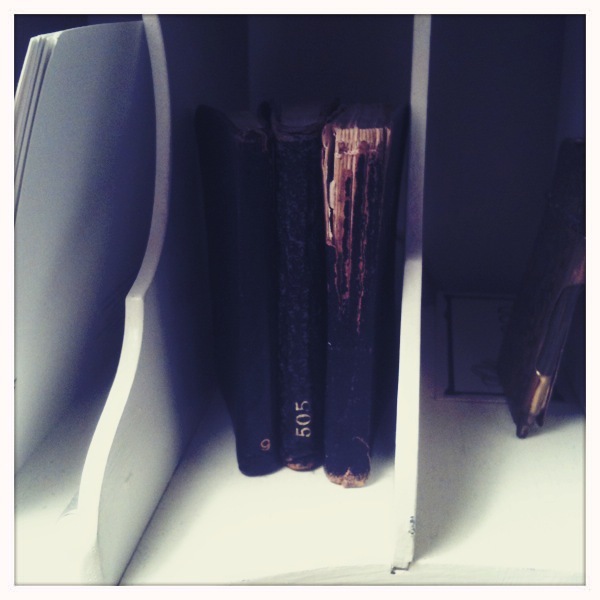 When I opened the well-worn diaries, I found every page filled with tiny, black-inked handwritting. It’s cramped and sometimes hard to read, but every day is carefully accounted for, right down to the weather report. 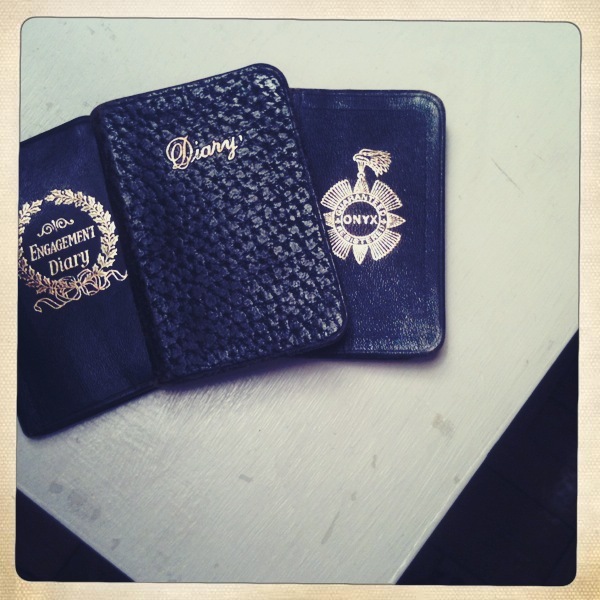 I purchased the three diaries for $20, took them home and began to read. Raymond’s life was ordinary. He went to work, he went home, he sometimes went out on dates or to the theater or bowling. I never finished reading the diaries, but they’ve always sat on a shelf in my secretary desk waiting for me to open them. This past November I began looking through them again. New details caught my eye. Buildings in Manhattan I never knew existed (and are no longer around today), walks through Central Park on the same date I had walked through it, 92 years later. The ghosts of Raymond’s footsteps mingling with my solid, present ones. I began to wonder more about Raymond Enders and the New York in which he lived — so very different and yet similar to the one I inhabit today. Where did he come from? How did he get to where he was? Did he ever fall in love? Get married? Move out of New York? I also wondered about our shared city. New York is filled with beautiful old buildings, most of which managed to stand the test of time and prime real estate, but other brick and mortar structures weren’t so lucky. I began to Google some of the places Raymond wrote about and discovered a New York I never knew, one that only exists in books, the archives of the New York Times or in the memories of the city’s oldest residents. Just as Raymond spent time documenting his life on paper, I spend mine typing words into the ether of the internet. Both methods of our documentation might eventually disintegrate, but for now, I want to breathe some new, virtual life into Raymond’s words. I want to see New York through his eyes and his footsteps. Every two weeks (or one month, depending on how active he was), I’ll document two weeks (or a month) in the life of Raymond Enders, either by visiting specific locations he mentions in his diaries or researching the ones that no longer exist, and writing about them. I’m hoping some friends or New York experts might be able to assist me with filling in the blanks … or at least help me read his handwriting. Whatever happens, the journey will be fun and a life will be relived, as I live out my own.